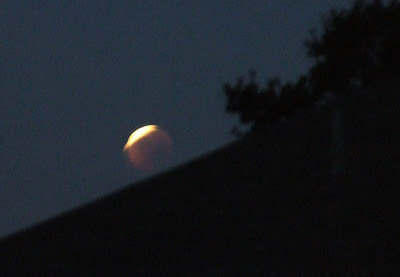 We caught a little glimpse of the lunar eclipse this morning just before it ducked behind the neighbor's house. These are best I could do picture-wise though I was snapping furiously and trying all different settings on the camera. I thought this was a Japanese Beetle, but it didn't have the tell-tale black and white puffs on the backside that all of the icky interesting websites said to look for. Not really sure I want to know what it is since it was swimming in the pool. But for what its worth... we named him Ringo. Good for you for catching the eclipse. :) I was up at 2:00 a.m. watching the sheets of heavy rain and the 70 mph winds. 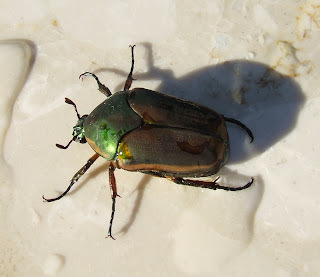 That looks like the Japanese Beetles I've been picking off all my vegetables! Yuck!! I can't believe you were up for the lunar eclipse -- with no infant to rouse you! Crazy girl! 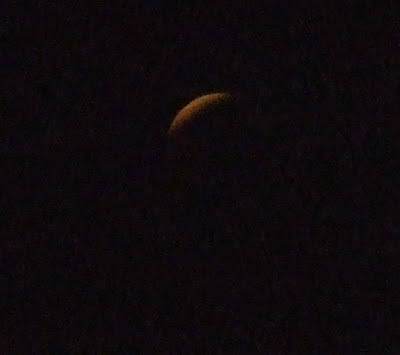 I saw part of the eclipse - about 5 minutes worth!